Purple vetch (Vicia benghalensis L.) is a climbing herbaceous legume from the Mediterranean area commonly used as a cover crop and green manure or for fodder, hay and silage. Vicia benghalensis is a vigorous straggling, climbing or trailing biennal or short-lived perennial legume. It has long lasting roots and erect habit during the early stages of growth and can reach a height of 40-100 cm. Purple vetch stems are slender, angular and striate, 20-80 cm long, densely pubescent or pilose when young, often becoming glabrescent (UC SAREP, 2006; Duke, 1981). The leaves are compound, made of several (10-16) pairs of leaflets and terminated by a tendril. The hairy leaflets are linear, oblong or elliptic in shape, 1-2.5 cm long x 1.5-6 mm broad. The inflorescence is a conspicuous terminal compact raceme of 2-20 large (13-18 mm) purple papillonaceous flowers. The fruit is a dehiscent pod, straw to brown in colour, pubescent, narrowly oblong, 2.5-4 cm long x 8-12 mm broad. It contains about 3-5 smooth, brownish-gray, black mottled seeds with a white hilum. The weight of 100 seeds is 4-4.5 g (Matic et al., 2008; UC SAREP, 2006). Vicia benghalensis is mainly used as a forage crop. It can be grazed or cut for hay and silage (Ecocrop, 2017; FAO, 2000; Duke, 1981). It is one of the best green manuring species for rice fieds in the USA. It is a soil improver and makes a good weed and disease break between cash crops (Matic et al., 2008). It was one of the Vicia species reported to hold much promise for drier areas (Le Houérou, 1985). Purple vetch (Vicia benghalensis) originated from the Mediterranean area. While other species of the genus Vicia have been cultivated for forage since ancient times, the cultivation of purple vetch for fodder started in Australia in the 20th century (Tate et al., 2006). In Europe and the USA it is mostly used as a cover crop (UC SAREP, 2006; Arvalis, 2017). Purple vetch is mainly used as a winter growing species (Duke, 1981). However, it is not a very winter hardy species and was referred to be a suitable winter crop only in the milder parts of California, Arizona, Alabama and southern Georgia (USA) and in Queensland (Australia). It can not survive frost below -9°C (UC SAREP, 2006). It can be grown as a spring crop in areas with harder winters. Purple vetch can grow where annual rainfall ranges from 310 to 1660 mm. Drought resistance is debated. Purple vetch was referred to as a species holding much promises for drier places (Le Houérou, 1985, cited by Enneking, 1995a), but it was reported to have no tolerance of drought (Duke, 1981). Purple vetch does well on a wide range of soils, from sandy or gravelly soils to clayey and loamy soils, provided they are well-drained (UC SAREP, 2006; Duke, 1981). Purple vetch can grow on soils with a pH ranging from 4 to 8.2. It has poor tolerance of waterlogging (Matic et al., 2008). Forage yields are variable, from 5.8 t/ha DM in Ethiopia, to much less than 2.5 t/ha DM in Australia (Tarekegn et al., 2015; Siddique et al., 1996). In Portugal, associations of purple vetch with rye or with cereals mixtures (oats and triticale, triticale and rye) yielded over 8 t/ha DM (Carnide et al., 2002). Vicia benghalensis establishes rather slowly and requires a well-weeded seedbed prior to sowing. It should be sown at 3-5 cm depth and can be either drilled or broadcast. In dry places, irrigation prior to seeding can be useful (UC SAREP, 2006). In early growth stages, purple vetch is a very poor competitor for weeds. It should be sown in autumn for winter grazing (in March, in Australia) (DAF, 2011). Purple vetch can be sown in association with cereals such as oats, or with grasses such as annual ryegrass (Matic et al., 2008). In the subtropics, it is possible to grow it with summer growing grasses (Matic et al., 2008). In Portugal, it was shown that purple vetch could be profitably sown in association with a mixture of oats and triticale, or with a mixture of triticale and rye (Carnide et al., 2002). Purple vetch regenerates poorly and should not be chosen for the establishment of permanent pastures (DAF, 2011). However, it has a rather high percentage of hardseededness which can make it a weed in the next crop (Matic et al., 2008). Purple vetch can be grazed though it is less resistant to close grazing than other vetches. It should be grazed or cut once it has reached 10 nodes (over 40 cm in height) and before pods forming (as the seeds are toxic). Purple vetch can be cut for hay or silage and harvested with a cereal harvester. 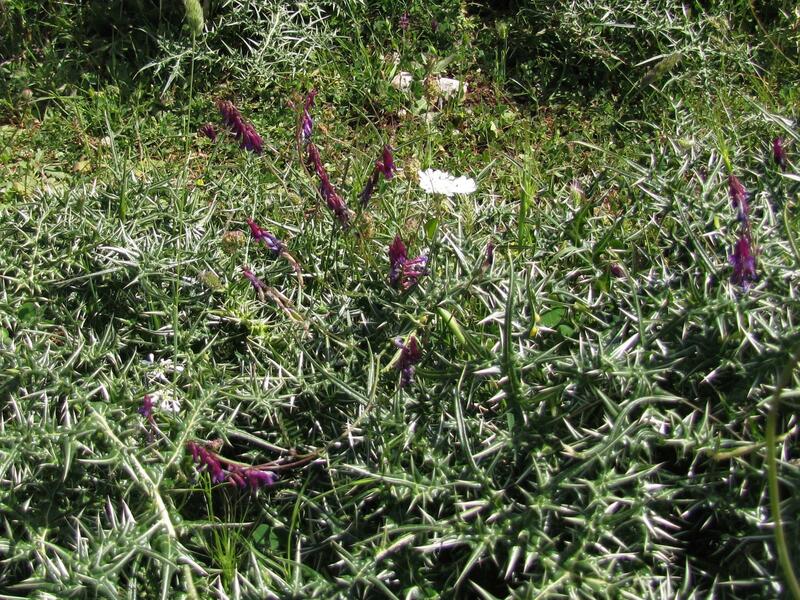 The best nutritive value of hay and silage is obtained for purple vetches cut just before flowering, but a good trade-off is to cut at flowering to increase forage yield while preventing the toxic effect of the seeds (Matic et al., 2008). 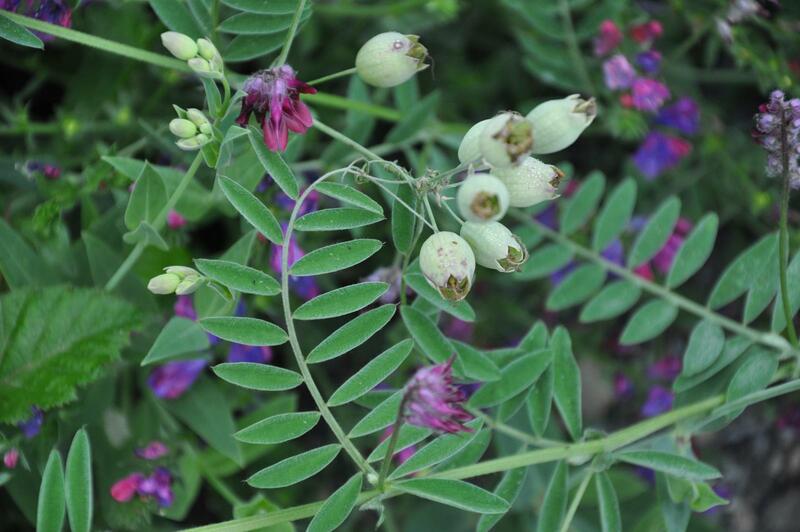 Purple vetch is an N-fixing legume that has positive effects on soil fertility, structure (loosening effect) and organic matter. It is beneficial in field crop rotation (Matic et al., 2008). In the USA, it is the most important green manure crop in rice fields (Williams et al., 2010). It was recommended to plough down purple vetch at flowering stage when it was used for green manure in vegetable crops, and to turn it under at the time of cereal sowing when it was used for cereal crops (UC SAREP, 2006). Purple vetch has been reported to be used as cover crop in orchards, vineyards and cotton crops (Matic et al., 2008). It gives fair erosion control when the plant is well established, or in areas of natural reseeding. Control is better when purple vetch is mixed with grasses and grains. Purple vetch (Vicia benghalensis) forage is quite rich in protein (18-29% DM) with a moderate to high fibre content (ADF 25-32% DM). The straw contains about 11% protein. There is limited information on the composition of purple vetch seeds. One reported sample has a protein content of 25% DM and is rich in starch (43% DM) and poor in fibre (ADF 11% DM). It is relatively rich in lysine (6.1 g/16 g N), but poor in sulphur-containing amino acids (2.1 g/16 g N) (Cunha et al., 1993). Vicia benghalensis seeds and forage have been reported to cause poisoning in humans and livestock (vicism, vetch toxicosis, vetch-associated disease) (Kobert, 1906; Enneking, 1995a). Lethal vetch toxicosis was reported in 1931 in 5-6 month-old pigs fed a mixture of Vicia sativa and Vicia benghalensis seeds included at 12.5% of the diet (Clough, 1931 cited by Enneking, 1995a). Cases of poisoning have been reported with cows and horse grazing purple vetch in South Africa. The latter suffered from emaciation conjunctivitis, blepharitis and severe alopecia. Histopathological lesions were compatible with systemic granulomatous equine disease (Green et al., 1989; Woods et al., 1992). The cause of vetch toxicosis in purple vetch has been debated: canavanine (a non-protein amino acid) may play a role in this toxicity (Enneking, 1995b). Seeds of purple vetch contain high levels (1.9-3.4 g/kg) of the toxic non-protein amino acid L-canavanine (Enneking, 1995b). After flowering, the levels of L-canavanine increase with seeds formation and make the use of purple vetch unsafe in the absence of alternative fodder sources (Tate et al., 2006). Purple vetch is palatable to livestock either green or dry. Occasional palatability problems, usually at the time of flowering, have been reported in Australia (DAF, 2011). Though purple vetch ranks third in vetches cultivated in Australia, there is almost no scientific reference on the nutritive value of purple vetch for ruminants. Purple vetch hay has good nutritive value and could make good fodder for growing and finishing livestock (Matic et al., 2008). It was referred to have no bloat effect on grazing ruminants, compared to other vetches (DAF, 2011). Purple vetch sown in association with cereals increased the protein content of the mixture. It was shown that a mixture of triticale and purple vetch, cut and dried, yielded in vitro 5.6 tons digestible OM/ha (Carnide et al., 2002). In Merino sheep, chopped purple vetch straw had a fair OM digestibility (46%), a relatively low metabolizable energy of 6 MJ/kg DM, and ranked 5 out of 7 legume straws for DM intake (67 g/kg LW0.75) (Abreu et al., 1998). DM degradability and NDF degradability for purple vetch straw ranked 4 out of 6 legume straws (Bruno-Soares et al., 2000). Purple vetch seeds are toxic to ruminants (see Potential constraints above). As for ruminants, the international literature on the use of Vicia benghalensis as forage (fresh or dry) in rabbit feeding is very scarce. In growing rabbits, very young purple vetch forage grown in hydroponic conditions together with oats (40:60 mixture) during 12 days could replace 20% of a balanced diet, without depressing growth and health conditions. The replacement of 50% of control diet by the hydroponic mixture most probably reduced growth performance, due to the relative imbalance of the whole diet rather than to the presence of toxic compounds, as no toxicity problems were reported (Santibáñez, 2005). Direct experiment with classically grown purple vetch harvested before blooming, and used as fresh forage or hay, would be welcome. According to the chemical composition, the expected digestible energy of the fresh forage for rabbits would be about 9 MJ/kg DM, and the protein digestibility about 63% (Lebas, 2016). In Portugal, purple vetch seeds introduced in the diet of adult rabbits up to 40%, as a full replacement for soybean meal, did not result in health alteration and did not depress diet DM digestibility, though protein digestibility decreased by 5 percentage points compared to the soybean control (Cunha et al., 1993). Purple vetch seeds are thus a potential source of protein for rabbits, with a calculated digestible energy of 14.2 MJ/kg DM (Cunha et al., 1993; Lebas, 2016).